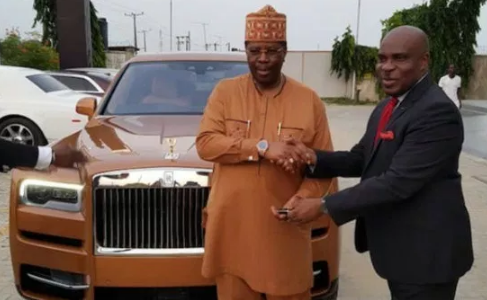 Wealthy businessman, Prince Bolu Akin-Olugbade has taken delivery of his brand new Rolls Royce Cullinan, the latest from the stable of British Automaker, Rolls Royce. The Rolls-Royce collector is the first African to book the 2019 Rolls Royce Cullinan and also the first to receive his bespoke SUV that starts at ₦120 million. But customized versions could push Prince Bolu's order price towards ₦250 million and above. Coscharis launched the new model last week in Lagos and Prince Bolu Akin-Olugbade bespoke limousine was used by Rolls-Royce representatives to launch the Cullinan SUV in Nigeria at the residence of the Deputy British High Commissioner to Nigeria at Queens Drive, Ikoyi, Lagos. Known for his high taste and fashion sense, the oil tycoon has about 10 Rolls Royces in his fleets, that includes the Phantom, Wraith And Dawn. They are all fitted with his customised plate numbers.